I'm going to give the "New Jedi Order" books another chance. This is a big deal for me. I love Star Wars, Star Wars characters, and the Star Wars Expanded Universe, but I haven't been able to read any of the books set after "Young Jedi Knights" since I read "Star by Star" waaay back in middle school. Because I love the Star Wars characters and the Star Wars EU, I couldn't even finish "Star by Star." I was too upset, too enraged by what happened to one of my favorite characters, who had just gone through some amazing character development the book before. 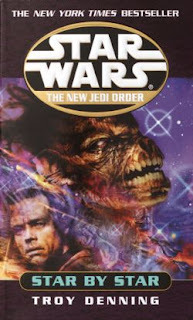 For years I couldn't talk about New Jedi Order, much less read it, without becoming extremely upset because of what happened to that one character in that one book. I've gotten past that, now. I've come to this decision thanks to this challenge put forth by the Fantastic Fangirls last year. It's not quite what they challenged their readers to do, as I had given the books a chance before, but it helped me realize that it's time to give up my grudge and stop making excuses. "Star by Star" wasn't the only reason I stopped reading those books. Before I ever picked up "Vector Prime," I knew the series would make the Galaxy Far, Far Away a darker place, and since elementary school the thought of creatures like the Yuuzahn Vong (the antagonists of the NJO books) has freaked me out. But, knowing ahead of time the grim events taking place in my GFFA, I started reading the series anyway. And what made me stop was the fear of change. New Jedi Order makes a point of drastic change in the beloved GFFA, something I was not prepared to face, despite my fore-knowledge of events. The reality of the fictional events caused me to retreat, and point to "inconsistent characterization" and "pointless death" and "a lack of hope" as the reasons for my withdrawal from the EU. "Inconsistent characterization," though, has been a problem in Star Wars books since long before NJO, and one of the defining characteristics of the Star Wars franchise has always been finding hope in the face of none. NJO is filled with changes, many for the worse for the characters I grew up loving, and these problems aren't solved in a book or three. They can no longer return to the status quo. There isn't the comforting knowledge of how things will be a few years in the future like there was when authors were filling the gap between the movies and Zahn's "Thrawn Trilogy." Things change, both for us and for the fictional characters we know and love. I need to face this. Now, like back in middle school, I know what will happen. Despite limiting myself to the Star Wars books written before 1999 (excepting of the "Jedi Apprentice" series and books written by Timothy Zahn), I've been keeping up-to-date on the Star Wars galaxy via the internet, and I believe it's finally time to dive back in. My recent entrance into the Marvel Universe, in some ways so eerily similar to the EU, has helped to arm me for this battle. I want to read more stories about the worlds and characters I love. I want to watch the children I've read about for so long develop and mature into members of the new Jedi Order. I want to learn about the Chiss and the other races of the Unchartered Territories. Dang it, I want to be able to check out the intriguing-looking "Star Wars: Legacy" comics and know the backstory! I will allow the changes brought by the "New Jedi Order" and the "Legacy of the Force" isolate me from a galaxy I love no longer! When I return to the U.S., I will confront my personal Sith of Geekdom and step into, what are for me, the Uncharted Territories of the Galaxy Far, Far Away. Wish me luck and ask yourself, what have you been hiding from? It's great that you're giving it another shot, BUT if it becomes overwhelming, seriously just jump to the bug series. You can find a synopsis on each book in the Wook, if you feel the need to catch up. I doggedly stuck through the NJO, but it didn't feel *gratifying*, I was just relieved that the whole damn thing was over. Del Rey did an awesome job of making the EU have "real" consequences... but did they have to kill the only functional Solo? Yeah, it's really the only thing I'm still bitter about. Hey, Mandy, thanks for the input! One friend of mine basically said to read the Allston books and feel free to ignore the rest of NJO, so I'll probably skip through any of the books that bore me, but I'll try to get through the series. I'll definitely keep the Wook and the Dark Swarm in mind for back-up, though. Thank again for the input! Ode to the Absurd or Thank You, Cable & Deadpool! New, From Japan: Ordinary People!